Whether running a presentation in a boardroom/conference facility or using technology in the classroom, scaling source devices such as a PC/Mac, laptop or Blu-ray player to the display device at the correct resolution can cause much consternation and head scratching. 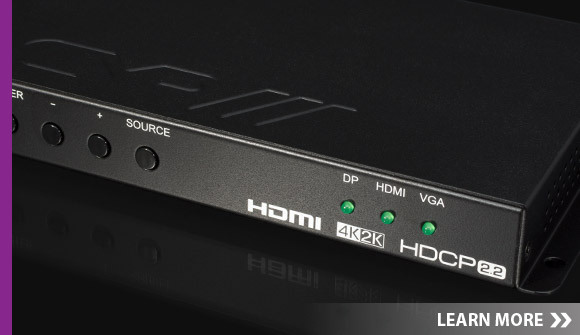 With the introduction of our new EL-6010-4K22, installers now have an interface that means no matter what the source, the display will scale to the correct resolution for the HDMI display, allowing for simple set up and for presentations to be displayed in the correct form. Featuring a wealth of adjustment options, including a wide-range of aspect ratio settings, contrast, brightness, saturation, hue and sharpness settings, users can simply adjust the source material to suit the display conditions, either from the front panel controls (with on screen display) or via WebGUI, IR remote, telnet and RS-232. For presentations that feature audio content, an analogue audio output allows for the use of an external speaker system or the simple integration into an auditorium’s sound system. With auto source detection designed to switch to the most recently connected source automatically or an alternative ‘live’ input if the current one becomes disconnected, users are safe in the knowledge that no matter what the circumstances or application, their presentations will be as vivid on the big screen as they were when they created them.